and fall injuries. We recommend using them on stairs, ladders, decks and walkways. They are easy to apply on fiberglass, wood, metal, tile and other smooth surfaces. 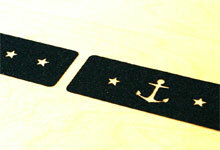 We've designed larger stickers that cover more surface area and are easier to apply. We'll be introducing new designs on a completely irregular basis. Subhead Grip Tape Stickers help avoid the very real and un-funny problem of slipping and falling. At sea or on land, help to protect your family, friends, and employees from injury. Subhead Anti-Slip Stickers add style and elegance to your deck or ladder, unlike the solid black stripes of grip tape we’ve seen in offices or in a warehouse. "It's so nice to see skateboarders helping our old folks. No, not teaching them how to ollie; showing them how to get a grip." Thanks to Boing Boing, High Snobiety, Boston Globe, Better Living Through Design, for their mentions of our products. We appreciate it. Subhead also helps to provide visual contrast. Stairs or uneven flooring will stand out and be recognized by friends, family or customers.